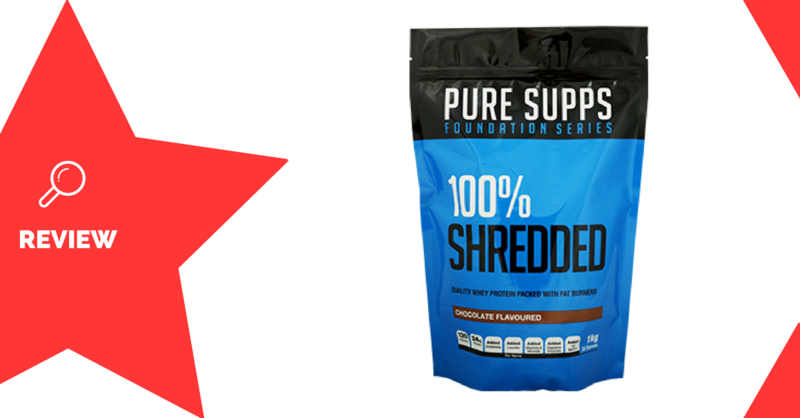 100% Shredded is a fat-loss protein powder manufactured by Pure Supps. It’s designed to help with muscle growth and recovery, as well as fat-loss. Pure Supps is an Australian-owned supplement company, who are best-known for producing cost-effective, single-ingredient products. Whey is sourced from cow’s milk, and is the one of the fastest-absorbed types of protein. It’s been shown to significantly increase muscle repair and growth (1). Isolate is the most pure form of whey, composed of about 90% protein, while concentrate is about 80%. Glutamine is an amino acid that is believed to improve muscle growth and recovery, but it’s not all that useful if you are already consuming enough protein (2). Carnitine is compound used by the body for energy metabolism. It can improve insulin sensitivity and decrease blood sugar levels, but it’s only really effective in people who are deficient (3). Green tea extract is a popular fat-loss aid, which can boost fat oxidation and insulin sensitivity (4). An effective dose is 400-500mg. Green coffee bean extract is high in chlorogenic acid. This compound has been shown to improve heart health and fat-loss (5). An effective dose is about 240-600mg. Garcinia Cambogia contains an active compound called hydroxycitric acid. Despite its popularity, it’s only been shown to have small, unreliable effects on weight loss (6). Athletes wanting a protein supplement that can also assist with fat-loss will enjoy 100% Shredded. 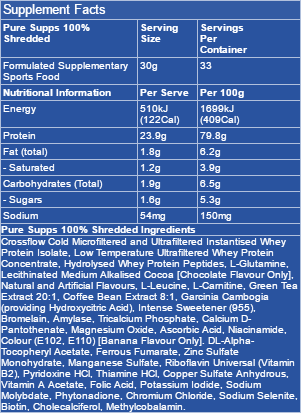 Mix 1 scoop (30g) with 250-350mL water or milk, and consume after your workout. Excess protein consumption can worsen an existing liver or kidney condition. Chlorogenic acid could have slight stimulant and laxative effects. Comes in 1kg bags to keep it fresh, no matter how much you buy. The added glutamine might not be necessary. 100% Shredded is a two-punch formula, which has benefits as both a protein powder and a fat-loss aid. It’s a low-calorie, high-protein formula which is great for post-workout consumption, or making up your protein numbers throughout the day. The combination of fat-burning ingredients will also give you a nice boost with your dieting efforts.